This set is perfect for making your very own naughty / nice holiday treats. The naughty and nice mold set includes 2 naughty and 2 nice molds for a total of 4 different designs. The set is made from FDA certified non-stick silicone with precise details and easy release of chocolates and baked goods. 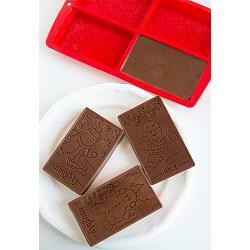 The naughty and nice mold set is microwave, oven, freezer, and top rack dishwasher safe. Each cavity holds 3.5 ounces.